William Herman Rau, born in 1853, was a Philadelphia based commercial photographer whose relationship with the Pennsylvania Railroad spanned his 35-year career in the business. Though he had numerous assignments with the railroad over the years, it would be two commissions that brought Rau to our attention in the 20th Century. The first assignment was from June to September 1891, the second, April to July of 1893. The commission utilized the relatively new concept of advertising photography to entice the leisure traveler to explore the American landscape by way of the Pennsylvania Railroad. Illustrating the terrain and destinations along the system, Rau worked with a mammoth plate view camera in the field, traveling in a customized passenger coach complete with living quarters and darkroom, creating almost 500 dry plate glass negatives during the two commissions. Plate 202: Special Photographic Train. This image depicts the locomotive and car outfitted for Rau's commissions of 1891 and 1893. 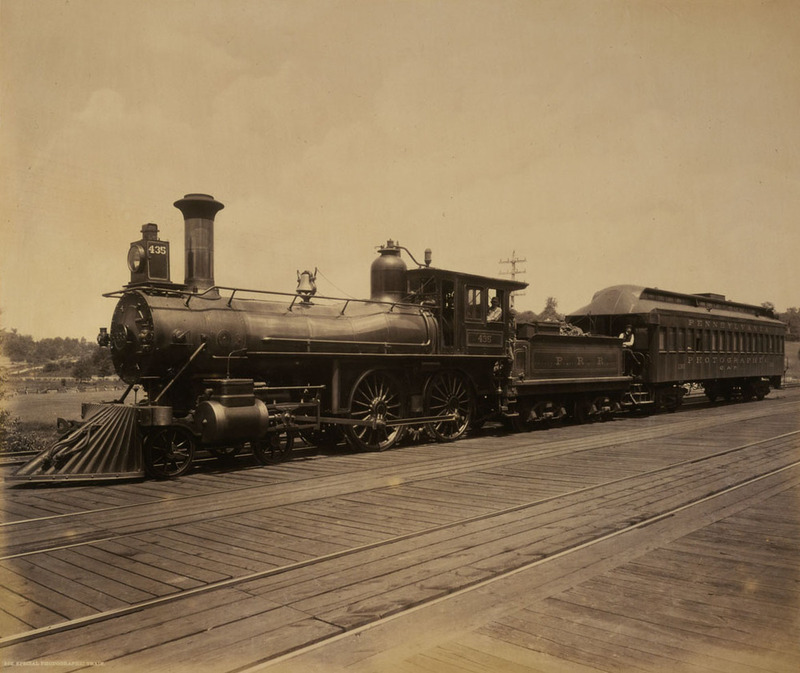 The coach was specially outfitted with a complete darkroom, living quarters and a platform on the roof for Rau to set up his mammoth plate view camera to make images along the railroad. Collection of American Premier Underwriters, Inc. In April of this year, it will be 120 years since Rau’s second commission: Through those years the mighty Pennsylvania Railroad rose to the occasion during times of war and fell to its demise in an unthinkable marriage with bitter rival the New York Central. Having never experienced the Pennsylvania Railroad first hand, it was Rau’s work that led me to understand a young and expanding railroad at the dawn of the 20th Century. In the details of Rau’s rich large format albumen prints we see a railroad building for the future, a railroad that today leaves a legacy of engineering accomplishments, providing the subjects for a modern photographic survey. Working backwards to recreate a visual tour of the former Pennsylvania Railroad, the Main Line Project relies heavily on the visual clues of Rau’s work to make informed and inspired images. In the coming weeks I am very excited to share more about the Rau commission and how it has impacted my project From the Main Line. These posts are part of a lecture on March 7th at the Library Company of Philadelphia, who has on deposit over 450 original images from the Pennsylvania Railroad Commission. If you are in the Philadelphia area I encourage you to RSVP for the lecture, March 7th at the Library Company of Philadelphia. The presentation will discuss how the dialogue between a historic and contemporary photo project evolves and will include a few original prints from Rau and myself in addition to the excellent exhibition, Frank Furness: Working on the Railroads. The Furness installation includes an amazing collection of artifacts, photographs and architectural drawings of architectural commissions for the Reading, Pennsylvania and Baltimore & Ohio Railroads.